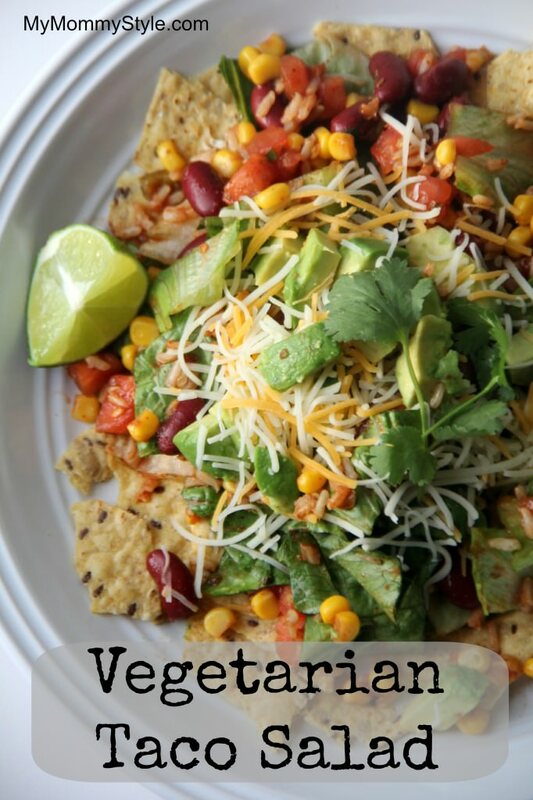 Nobody will miss the meat in this awesome vegetarian taco salad. It’s zesty, colorful, and so delicious! Heat oil in a large nonstick skillet over medium heat. Add onion, cook and stir until the onion begins to brown, about 5 minutes. Coarsely chop 1 tomato. Add it to the pan along with corn, rice, beans, chili powder, cumin, 1 teaspoon oregano and 1/2 teaspoon salt. Cook, stirring frequently, until the tomato cooks down, about 5 minutes. Let cool slightly. Coarsely chop the remaining 2 tomatoes. Combine with cilantro, salsa and the remaining 1/2 teaspoon oregano in a medium bowl. 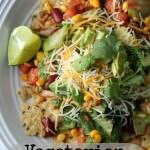 Toss lettuce in a large bowl with the bean mixture, the fresh salsa and 2/3 cup cheese. Serve sprinkled with tortilla chips, avocado, and the remaining cheese.